You’d be excused if you’ve been double-checking the date this fortnight. Yes, it’s 2017 and not a decade – or two – ago. But the sense we’ve turned back time at this Australian Open can’t be denied. At the start of the second week, the possibility of a final showdown between Serena and Venus Williams is still strong. Adding to the nostalgia, Roger Federer and Rafael Nadal are also on course to meet in the final, reviving memories of the 2009 epic in which Nadal fought for five fierce sets to claim his lone Australian Open title. It’s not the only way that the past is being gloriously revisited in 2017 – old-fashioned style is in vogue again too, as Mischa Zverev demonstrated in his fourth-round upset of Andy Murray. As he stunned the five-time finalist, the 29-year-old German called on a classic serve and volley style that hadn’t been so effectively implemented in years. Zverev played 118 points at the net, winning 55 per cent of them, to bewilder his more experienced and statistically superior opponent. “I believed in myself. I believed in my game,” said Zverev, who at world No.50 was hardly expected to seriously challenge the world No.1. Whether the serve and volley approach will work in Zverev’s maiden Grand Slam quarterfinal is another matter. The crafty left-hander now takes on Federer, who hasn’t surrendered a set in their two career matches; in their last match, at Halle in 2013, the Swiss star didn’t even allow him a game. But while moving forward on court has provided Zverev with a career-best result in Melbourne, he’s also been moving forward in other ways too. His career was for a time dramatically halted by back, knee, rib and wrist injuries – he required surgery for the latter in 2014 – and in 2015 he dropped outside the world’s top 1000. With his own career stalled, Zverev started travelling to tournaments with juniors who were friends of his younger brother, Alexander. Zverev’s top 100 return, which only occurred last October, was helped by qualifying for the US Open and a quarterfinal run at the Shanghai Masters. All of which could make the resurgent Zverev a challenging opponent for Federer. “Obviously he's on a high right now,” said the Swiss star, after his five-set win over Kei Nishikori in the fourth round. "He's feeling great. Probably feels the best he's ever felt on a tennis court. Also on Federer’s mind, however, will be the impressive manner in which he’s returned from his six-month absence due to injury. Following a pair of wins against qualifiers, the four-time Australian Open champion now has impressive wins against world No.10 Tomas Berdych and world No.5 Nishikori. “I think I’m playing better and better,” he said. Results have been equally encouraging for Venus. The most senior woman in the women’s singles draw, at age 36, she's yet to drop a set against Kateryna Kozlova, Stefanie Voegele, Duan Ying-Ying and Mona Barthel. Venus now takes on 27th-ranked Russian Anastasia Pavlyuchenkova, who she has defeated in three of the five occasions they’ve met. While attention has already turned to a potential final against Serena, the experienced Venus is taking a more cautionary approach. “Today I played a qualifier, and she hardly ever missed. So it doesn't matter who you come up against, they are coming and they want to win, too,” Venus warned after her latest win over Barthel. Even so, the tennis purists can’t help but imagine the sibling rivalry that could be revived at Australian Open 2017. The sisters famously played their first Grand Slam match in the second round at Melbourne Park in 1998, when the 17-year-old Venus was the straight-sets winner. At the 2003 tournament, Serena defeated Venus in the final to claim the first of six titles here. The focus will be firmly on the present as quarterfinal action begins at Melbourne Park on Tuesday. At the same time, there are few players who can compete with such happy reminders of times past – and many fans who’d love to see that history revisited. Amid the hype of Federer’s comeback, has countryman Stan Wawrinka been flying under the radar? The 2014 champion takes a 4-3 head-to-head lead into his quarterfinal against Jo-Wilfried Tsonga. 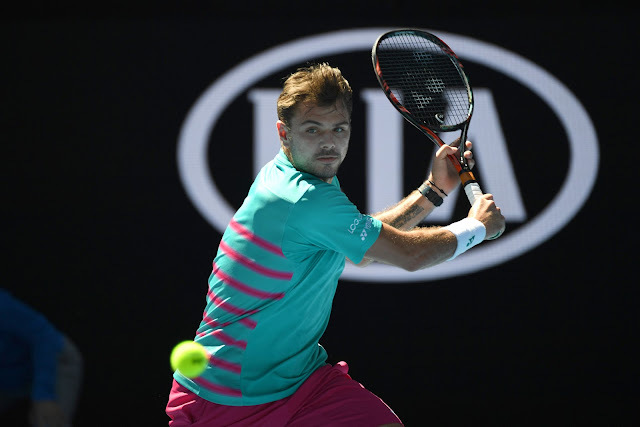 Most encouraging for the fourth-seeded Wawrinka is that his most recent over Tsonga, the No.12 seed, was in his title run at the 2015 French Open. 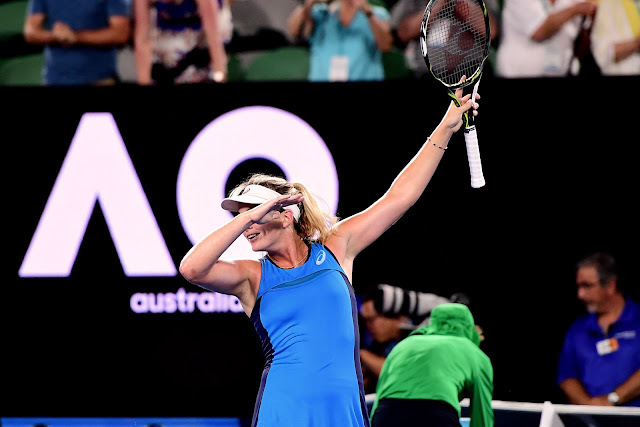 CoCo Vandeweghe will be high on confidence after her straight-sets upset of world No.1 and defending champion Angelique Kerber. Still, the 35th–ranked American will be on guard against No.7 Garbine Muguruza – particularly given the form the 2016 French Open champion has rediscovered in Melbourne, progressing to her first Australian Open quarterfinal without the loss of a set. They’ve played three times, Vandeweghe winning twice. Mischa Zverev is not only an accomplished professional player, but a qualified pilot too. “I’ve always been fascinated with airplanes and all the aerodynamics,” he recently told the ATP World Tour. For now, though, the German is focused entirely on his tennis career – which is hardly surprising, given the heights he’s achieving on court.